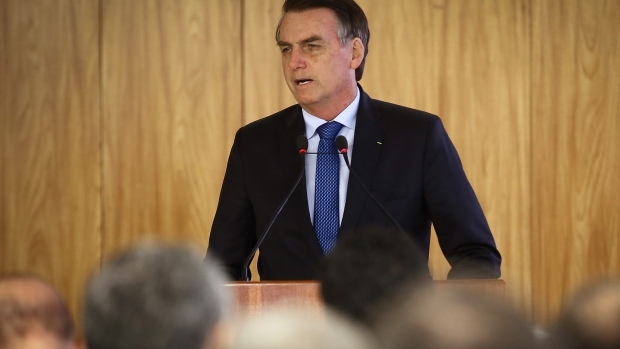 (Bloomberg) -- Brazil’s President Jair Bolsonaro is expected to be discharged from hospital as early as Wednesday, according to doctors and government officials. The latest medical bulletin released by the Albert Einstein Hospital on Tuesday afternoon said that the president’s health continues to improve after intestinal surgery and a bout of pneumonia, but it made no mention of a release date. Onyx Lorenzoni, Bolsonaro’s chief of staff, told reporters in Brasilia earlier in the day that the president should be back in the capital by Thursday or Friday. On Monday Bolsonaro was transferred from a semi-intensive care unit to a private room. The president has been in hospital since Jan 28. for follow-up surgery related to injuries sustained in a knife attack. Antonio Luiz Macedo, one of the president’s surgeons, told the newspaper O Globo that he stood by the forecast of a Wednesday release date. A presidential spokesman told Bloomberg that the doctors were best placed to make that decision.